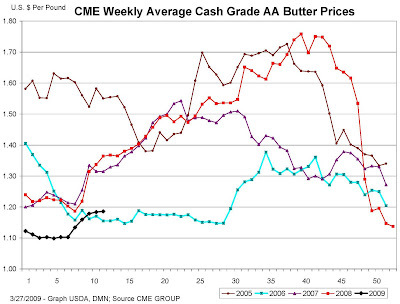 Cheese and butter prices firmed this past week at prices above their year beginning lows. The lows in the first weeks of 2009 were the lowest prices in the last 5 years. The graphs shown below are always available via the links in the right hand panel, but they are published in this post to bring them to your immediate attention. The charts linked in the right hand panel are updated every Friday based on the week's trading activity. 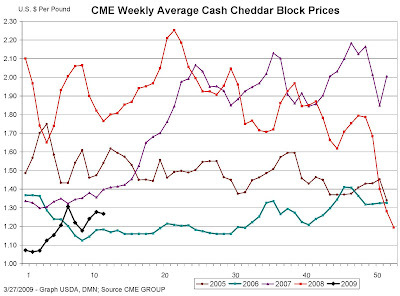 The cheese prices shown here are from the CME statistics. The prices used for the Class III milk protein valuation are actually from the NASS market survey which typlically lags about two week behind the CME numbers. More on this in an upcoming post. Butter prices also firmed near $1.20/lb. While they are below the the longer term average of ~ $1.50/lb., they are finally coming off the lows of ~ $1.10 recorded in early 2009. Which graph - cheese or butter - is most important to dairy producers? The answer may surprise you. We'll analyze this in an upcoming post.